At this time, as you reflect on all that you’ve achieved this year and on your hopes and aspirations for the future, it feels appropriate to offer my letter to Jane, that I included in the epilogue to Create New Futures. “I feel like an impostor,” Jane told me. She was one of the brightest young professionals I had ever encountered, much wiser than her young age might lead you to think. “Sometimes I am amazed at the responsibilities and opportunities handed to me. Inside of me is a nagging fear that I may be found out, that I cannot be that good,” she added. 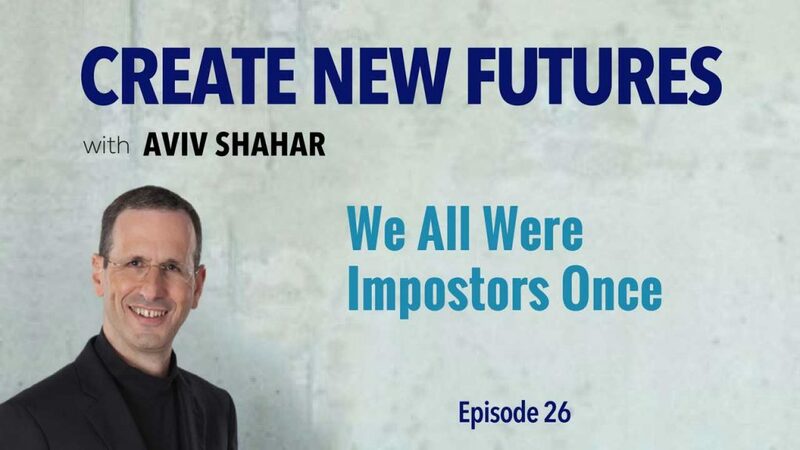 The other names for the impostor anxiety are the “fear of becoming an authority” or “the fear of having power.” Many people suffer from and grapple with a form of this anxiety. I, too, have experienced my share. I skipped the academic route, and I largely skipped the corporate road. Instead, I chose to travel a different path. In my mid-forties, my father-in-law continued to ask occasionally when I would start studying at the university. “But Moshe,” I would smile, “do you realize I already have PhDs and senior executives participating in my seminars, coming to learn from me?” Like my father, his educational opportunity was stolen during World War II, when he escaped Warsaw to join the Jewish Brigade in the Russian Army to fight in support of the Allied forces. For the rest of his life, he retained his desire and love for education. I am lucky. Both my father and mother learned early on to trust that I was following my own inner guidance. In fairness, they each struggled with their own full plates of responsibilities, leaving me largely to my own devices and convictions. A true gift indeed. I realized Jane was asking me to afford her the same validation I had received from my parents. “How can I provide the touch of confidence and self-belief she needs?” was the question I pondered. I sat down to write the following letter to Jane. When it comes to overcoming fear and anxiety, consider that you already have conquered the first great fear that every human must face: that of appearing in this world. Nothing can be more overwhelming than being born into this strange world. The sheer courage to emerge from the womb into the helplessness of total dependence on the adults around you (who in some cases are ill-informed and not very helpful) is powerful beyond compare. Some will say the reality of being born is inescapable and automatic. However, I believe it represents the greatest act of courage and faith, more significant by an order of magnitude than any other we perform thereafter. The awesome realization that a soul presence and a spirit inhabit the body early in its development to fortify the birthing act, signifies for me the great light that shines through every day of my earthly living. When I am beset with fears, I remind myself of the courage of my birth. I then recall the incredible challenges I have overcome, and the miraculous events that followed as a result. I remember the heart specialist who never looked me in the eye when he said to my father, “Your son has a condition that needs to be monitored and he should not exert himself,” which I mistakenly interpreted as a death sentence. Talk about fear… I was left physically shaking. To banish that fear I started running in earnest, winning the Israeli long distance running championship five years later. None of my competitors knew that I was not competing with them, but fighting against my own fear. Later, as an Air Force pilot, I nearly crashed more than once and had a few flight near-misses. Those experiences made me realize that I never am alone, never without support or guidance. Even when I fall on my face, I am not without help, except in times when I allow fear to separate me from the bounty of care and guidance that is freely offered. And even then, I still am being watched over in spite of myself. We all are. There is evidence galore that so much in this universe is willing and ready to help you, to help me, to help us all. Much is invested in our success. My improbable journey and yours bear testimony to this truth. Living is a theater. We all are here on a journey of discovery. Pretending or faking it until it is real is one of the fastest ways to syphon learning. We all were impostors on the first day of school, the first time on the soccer field or in the choir, the first time we were caught up in the act of love, and in the first solo attempt at driving. Impostor anxiety is merely the echoing hangover of these experiences. Therefore, central to the development journey is the updating of one’s own self-view. As we grow, we all must release the old self-views that no longer serve us well. Living is about overcoming setbacks, disappointments and challenges. It is a journey in which you make new connections, unfolding the reason and purpose why you are here on this Earth at this time, and get closer to the supreme realization and knowing that your life matters. The vistas of possibilities that have opened up in my life extend beyond what I had imagined. More often than not, they have been a source of great surprises. The most radical moments of breakthrough always found me when I was able to gently unburden myself of my limiting beliefs. Often these beliefs centered on a view I had held dearly and could not imagine being without. Time and again, a methodology or a way of working that had seemed essential, with no apparent way to proceed without it, would then appear to be a figment of my own imagination that had initially acted as my crutches. All I had to do was lay them down and release the mental model that had enabled them in the first place. There is very little we achieve or do on our own. I would not be where I am today without the help of many people. I never forget this fact. There has been a chain of never-ending miracle workers: the teacher who did not give up on me when I struggled, the stranger who rescued me at a point of desperate need, the friends and communities that still provide me with fortitude, the clients who trusted me. The list goes on. I tell you this for a fact: as you wake up every day, many people—some knowingly, but many not—are conspiring to help you take the next step to carry you forward, to help you grow and evolve beyond your wildest imagination. Always remember, there is an army of helpers fighting for you, even when you do not see them. They need you to do your part. They need you to make an effort. They need you to make your next move in order for them to show up and help. And you, too, are part of an army of helpers for others, some of whom you know, others whom you do not. You are here for a purpose. Remember, you have an extraordinary gift. You can learn today what you did not know yesterday. Time and again I have been in situations that felt like I was drinking from a fire hose. Without exception, the learning journey is non-linear. Learning even can bend time. When the need is urgent, certain interventions can be designed to create an immediate transfer of three months’ worth of learning in just three days, or even faster. First, there is almost nothing I cannot learn. If my life or family depended on it, I probably could act in a movie as a convincing though imperfect stand-in for George Clooney. Second, and even more importantly, I fear no person, alive or dead, in business, academia, politics, or any other field. I am prepared to hold a conversation with anyone —a head of state, a Nobel Prize laureate, a powerful CEO or a saint—human to human, free of fear. I know that when we sit down to talk, I will find ways to create mutual value. Just as I am capable of bringing a unique perspective that enriches us both with new understanding and insight, so are you. The only other point to remember is that we all use the toilet (except Canadians, who use the washroom). That fact, along with the knowledge that we each are unique and carry the gift of our experiences, liberates me to recognize there is no person we should be afraid to meet, or worry that somehow, we are not up to the task. I tell you that you are more than enough, that you can and will do well in any circumstance. You must believe in yourself: so much in this Universe already does believe in you, and expects and awaits your joining in that belief. I believe in you too.